Typical construction incorporates an overhead air delivery system to condition the space. The system is usually fixed into place and has little or no flexibility for the end user. This results in thermal discomfort depending on where you and the overhead diffuser are located. Cool air pushes down from the ceiling and often mixes with the warmer air that has been exhaled by the occupants. The return air is also located in the ceiling and can pull the cleaner in air rather than the warmer air making it an inefficient system. Under floor air systems focuses on conditioning only the first six feet of occupied space. Through natural stratification, the cool air comes from the floor to the occupants and rises to the ceiling after it has become warmed. Using passive swirl diffusers allows occupants to be able to control their own thermal comfort. 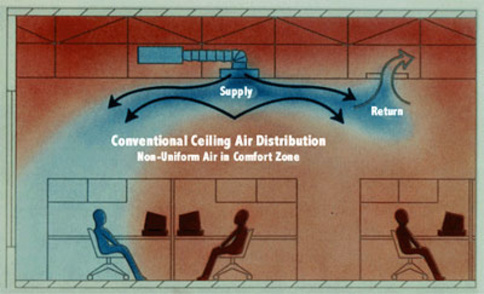 The return air is located in the ceiling to ensure that you are only filtering dirty air. Click here for the underfloor air brochure.